The spectacular White Mountain Region of Northern New Hampshire is a popular travel destination any time of the year. Great sight-seeing, White Mountain skiing, hiking, fishing, antique hunting, tax-free North Conway outlet shopping, and snowmobiling makes this New Hampshire vacation spot perfect for anyone interested in a White Mountain Inn vacation for relaxation or enjoying the NH outdoors. 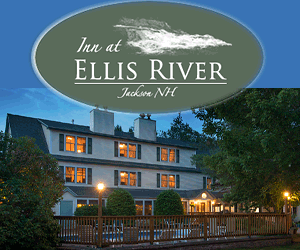 Nestled by a mountain stream at the edge of Jackson, a classic New England village. A perfect choice for a weekend getaway, skiing or hiking vacation, or to celebrate any special occasion. 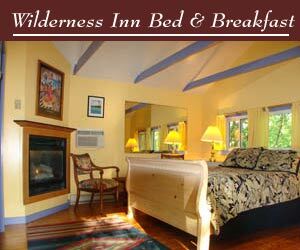 The Wilderness Inn in Woodstock is snuggled within the White Mountain National Forest, five miles south of Franconia Notch State Park. The perfect location for your White Mountain vacation. The inn offers the perfect setting for intimate celebrations with up to 50 guests. Dedicated to assisting with your small New Hampshire wedding or elopement to make your special occasion everything you imagined...and more! 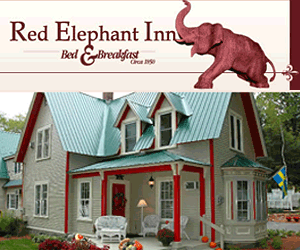 Welcome to the Red Elephant Inn, a four-season bed and breakfast with a distinctly modern flair! The White Mountain – Mt. Washington Valley region of New Hampshire is home to many of the northern New England’s better inns and B&B lodging. There are also some outstanding White Mountain restaurants and chef-owned dining venues and tax-free New Hampshire outlet shopping. The White Mountain Region of New Hampshire is where you’ll find; Conway, North Conway, Littleton, Jackson, Glen, Lincoln, Woodstock, Whitefield and the scenic Kancamagus Highway, Franconia Notch State Park, White Mountain National Park, The Flume, and other White Mountain attractions. Ask us about White Mountain NH Inns. 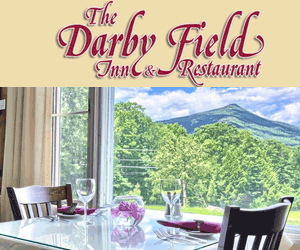 To feature your New Hampshire White Mountain Inn or Bed and Breakfast lodging accommodations, please contact us. Visit the NH Mt. Washington Valley, White Mountain region and historic North Conway. The tax-free North Conway Outlet Stores and thousands of acres of White Mountain National Forest means there is always something to do for everyone in the NH White Mountain region. New Hampshire's Internet Magazine suggested White Mountain Inns offer exemplary lodging accommodations.